We need a replacement halo kit. It's about 8' and we have a concrete base. What do I need to provide to get a price? Thanks for inquiring about the 8' halo. 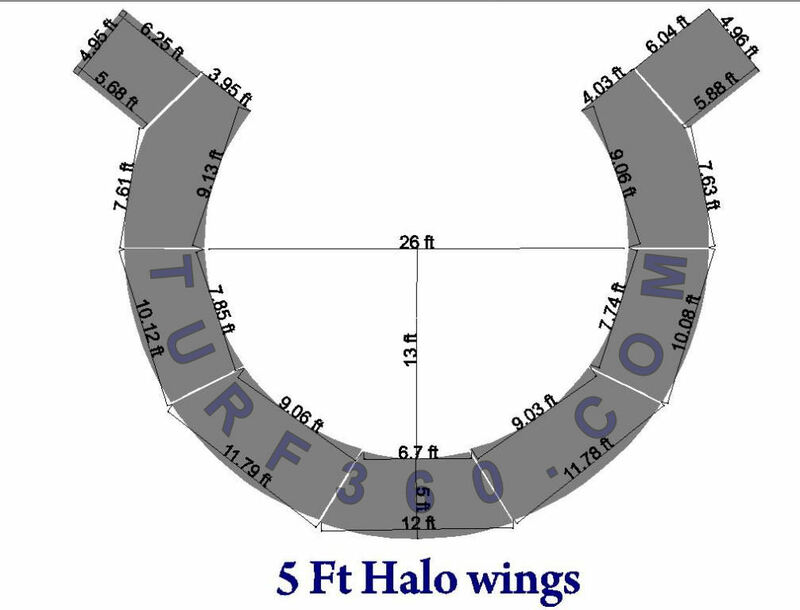 We will need the overall dimensions on the turf and wings. Please confirm that the overall thickness is 8' and it has a uniform, consistent thickness. As for the wings we'll need the 3 measurements on each side. Basically the inside & outside length running down the first base line and the same down the third base line. You can ignore most of the measurements. This just shows how a 5' halo is split into pieces. The main thing I wanted to show is the measurements on the wings. There's essentially 3 measurements on those - 5.68', 4.95', & around 10' on the inside. We'll also need examples of the logos that you wanted on there if there's anything other than block style lettering. Please let me know if you have any other questions.